Understand and analyse linkages among ecosystems, livelihoods and climate change. Identify and prioritise EbA options for community and ecosystem resilience. Design project activities that facilitate implementation of priority EbA options. Identify key elements and indicators for a monitoring and evaluation (M&E) framework. In Module A, you will systematically analyse links among ecosystems, livelihoods and climate change, to better understand vulnerability to climate change and the role of ecosystems in adaptation. In Module B, you will identify and prioritise EbA options for community and ecosystem resilience and design project activities that facilitate implementation of priority EbA options. In Module C, you will identify key elements and indicators for a monitoring and evaluation framework. The target audience of ALivE is made up of two groups: users and stakeholders. Expected users of ALivE include project managers and practitioners working at the local or community level designing or implementing an EbA intervention. The secondary audience consists of stakeholders in the EbA planning process, including community members, local authorities, NGOs and policy-makers. Users of the tool will work closely with these stakeholders. When should I use ALivE? ALivE is designed to be applied in the context of a larger adaptation project that has already established an objective to integrate EbA options. The tool should be applied during the design phase of such an initiative. It will be most effectively used in places where strong relationships with stakeholders have already been established. Why should I use ALivE? 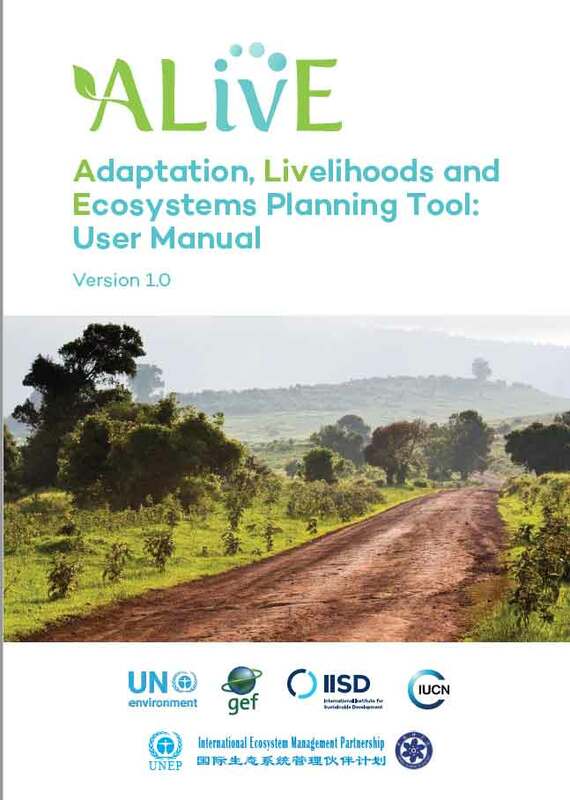 ALivE takes a step-by-step approach to identify EbA options, taking local ecosystems, livelihoods and climate change into consideration. It provides you with a user-friendly process to determine whether EbA options are feasible and likely to be effective. ALivE also helps you to identify elements for an M&E framework during the planning stage. Users will need to have access to a computer and internet connection to download the tool. However, the tool itself can be used offline. Access to existing information and analysis on ecosystems, livelihoods and climate change in the target area will provide input to the tool. Expertise in climate change adaptation and ecosystem restoration, conservation and management are useful but not mandatory. ALivE is a computer-based analysis that relies on information collected from desk-based and participatory research processes. The time required to undertake the gathering of information will vary and depend largely on the scope of the analysis, the amount of information already available about the target area and the existing relationships with local stakeholders. Once all information has been collected, using ALivE will generally only take a couple to a few days. ALivE is not a substitute for a stand-alone comprehensive climate risk assessment or detailed environmental assessment. It does not take users through all of the steps and stages involved in a full project planning cycle. ALivE does not include a cost-benefit analysis for EbA options. We recommend that users review and familiarize themselves with the user manual before launching the computer-based tool. The user manual provides you with detailed guidance on applying ALivE as part of an EbA planning process. In addition to step-by-step instructions for using the tool itself, the manual provides a framework and methodologies for collecting and organising the information required to use ALivE, as well as guidance on identifying entry points for integrating EbA into policies and planning processes. If you have a story to share about using ALivE – how it was applied, the benefits and challenges, of how we could modify the tool to better meet your needs, please send an email to aterton@iisd.ca.